Kansas City Track Club's Westport St. Patrick's Day Run is a RRCA Missouri State 4 Mile Championship Race. Since 1958, the RRCA has awarded championship events at the National, Regional, and State level to promote the sport of distance running, recognize well run events, and award top performing runners in the open, masters (40+), grand masters (50+), and senior grand masters (60+) categories for both men and women. We are extremely EXCITED to announce that the 2016 Westport St. Patrick’s Day run has been chosen as one of the RRCA State 4 Mile Championship Events!! The Elite Runners Start will contain runners with mile paces below 7:30. All other paces will start at 10:05 A.M. We are adding pace groups this year, with groups starting every half minute! This will help the start of the race flow smoother. 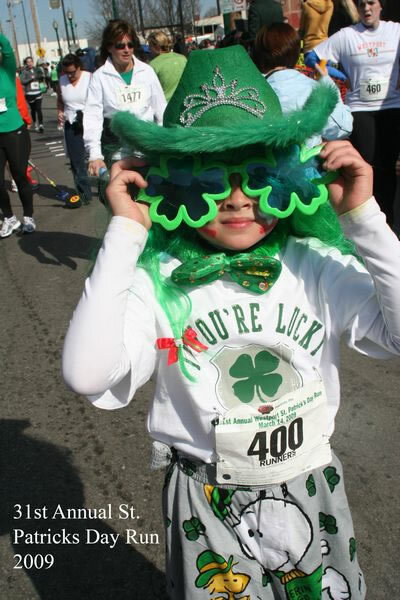 The Little Shamrock Fun Run for kids will be at approximately 11:15 A.M. THIS IS A FAMILY FRIENDLY EVENT. STROLLERS ARE WELCOMED AT THE END OF THE LINE. The Kansas City Track Club is excited to team up with Big Brothers Big Sisters of Greater Kansas City as the official charity partner of the 38th Annual Westport St. Patrick’s Day Run! Click here to find out more about Big Brothers Big Sisters. Saturday, Race Day from 7:30 to 9:30 AM at Manor Square lobby. Parking will be available in designated Westport parking areas. Please do not park along the race route as vehicles will be towed. LIVE results will be posted HERE immediately upon crossing the finish line! You can also sign up during registration to receive results sent directly to your mobile phone, Facebook wall, and Twitter page! A short video clip of you crossing the finish line will be included with your results! A Competitive Team consists of 3 or more runners. Prizes will be awarded to the three fastest teams, judged by the low total cumulative time for the first 3 finishers on each team (a “cross country” scoring format). A Centipede Team consists of 3 or more attached runners. Think up a theme and make costumes! Cash awards of $100, $70, and $30 will be presented to the three most creative teams. The fastest Centipede will be awarded $60. Fashion & Festivities Costumes and festive attire are encouraged, so start planning your outfit today! The top 3 most creative costumes win prizes. Join us in a sing along of “When Irish Eyes Are Smiling” before the race and let your mind wander into the hills of the fatherland. 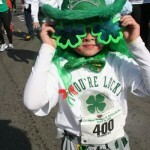 Dance the best Irish Jig Contest winners receive a $25 Cash Prize. If a family of 3 or more sign up for the race, your name will be entered in a drawing for prizes from Merchants- to be announced at the race. Must be present to win. Split times will be called at the one, two and three-mile marks. Participants must move to the sidewalk after 90 minutes (11:30 A.M.). This event is timed using a disposable bib tag timing device. No need to return your chip when you are done! There will be gift certificates, and awards for overall winners and first place age group finishers. Shirts will be guaranteed to all participants that register by February 12, 2016. Three Inch Finisher’s Medal for all this year at the Westport St Patricks Day Run! In Irish we would say this is “toirtiúil” – Large! Runners and walkers will start on Westport Rd, at Mill st. Head West on Westport Rd to Jefferson St. Then turn Left, heading South on Jefferson St. Make another Left onto 43rd St., heading East. Turn Left onto Warwick Blvd, heading North to 38th St. Turn Right on 38th St, heading East. Take 38th St. to Gillham and make a Left, heading North on Gillham on the west side of the road (Gillham is a divided road). Turn Left onto Linwood Blvd, heading West. Turn Left onto Broadway, heading South. Turn Right onto 34th St, heading West. Then turn Left onto Pennsylvania Ave, heading South. Follow to the Finish Line!